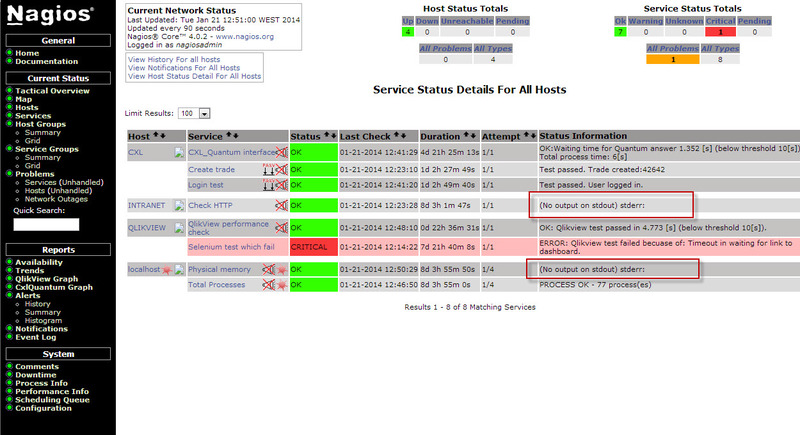 1) We have installed nagios windows server & clinet ("NSCP-0.4.1.73-x64.exe(NSclinet ++)) successfully and also we are able to connect the host using check_nrpe. present we are facing the issues with configurations, we are not able to add more host entries & services in configuration, could you please help me in adding multiple hosts and services. because of this issue we are not proceeding further. Installed Nagwin as per installation instructions and after starting all the Nagwin services, tried accessing http://localhost but the page never loaded. After going through FAQ's, tried changing the port from 80 to 11790 in \etc\nginx\nginx.conf to see if http://localhost:11790 works or not, but the page is still not loading. I installed CopSSH 4.2.3 about 2 years ago on a Windows 2008 server. We never did get it work properly and basically abandoned the project. However, I have issue with Windows updates not getting installed properly and this started about the same time I installed CopSSH. I would like to uninstall CopSSH but I cannot find a way to do that. It is not listed in "Programs and Features". I tried running the installation routine but didn't see an option to uninstall. Can you please tell me how to completely uninstall the application and remove any remnants. Detailed Command Logging Levels Possible? Are command detailed logging levels possible with CopSSH 4.9? ie can I see visiblity into session commands like cd, mkdir, etc? I am trying to troubleshoot an automated client, which continually fails operations after successful login. I have tried to change the various logging levels in the CopSSH control panel, all the way to Debug3, but still can't get much more than login success/failure in the logs. I can't post in the other thread anymore. (/content/setuid-failed-operation-not-permitted) I'm not sure why. The same issue still applies, except this time I've uninstalled FullSSL and replaced it with the standard version. I've copy/pasted the updated support request below, but you won't be able to read it because this forum eats the format and spits out a mess that drives me crazy. Sorry I'm ranting. I activated a user 'test1' with CopSSH. This user is a local account on windows 2008. I'm able to transfer files from Linux to windows but get prompted for the password for test1. Don't see how public/private keys would be useable. How can I avoid the prompt so I can run this as a batch script? rsync -avz -e "ssh -p 22 -i /home/test1/.ssh/rsync-only " /home/test1/backup/dummy_file.txt "tester1@usctapd1234:/cygdrive/d/output"
A few days ago, we started having winrpe issues, and being the windows expert I am (I prefer linux), I decided that the easiest way to resolve this was to uninstall and re-install winrpe. It wasn't until the second installation (fullSSL) I started to track down where the problem was. I updated my check_winevent to version 1.3 after I was having problems excluding multiple services. Now multiple exclusions are working when I try them in the command prompt but all of my services that use check_winevent are now reporting "CRITICAL: Return code of 84 is out of bounds." Does anyone know how to fix this? Is there a procedure for migrating users of a very old version of COPSSH (1.4.2) to the latest version (4.7.1)? Ideally this should be done transparently for the end user so that they don't have to re-supply their public keys and so on. The answer given indicated to manually update the "bin\copsshcp.config" file. But is there no way to copy an equivalent file from the old version of COPSSH to the new version? How can I fix the following in the default .cfg file for the following to stop it from showing errors? Whoops! Error: Could not read host and service status information! I've tried all the different guides to using Winrpe to find the host and services when I place the different .cfg files under /etc/nagios/nagwin and on the remote machine it's installed like examples have shown with nrpe.cfg altered like itefix example. I've tried to get this to show up and nothing works! Hi! I'm trying to exclude codes 5000 and 20 from my check_winevent service. I am able to exclude one or the other but not both. Basically using --code !5000 or --code !20 works but --code !5000,!20 does not exclude either code. Problem with Status Information field: "(No output on stdout) stderr:"
Are there any resolutions for that? Can you help to show how to do rsycn from windows to linux on server windows? I already install Cwrsync on windows and I want to configure Cwrsync to sync from windows to linux on windows server. I was using SSH with -q -T options on older version of COPSSH, but I have upgraded now to latest one. After upgradation, I found that its not working in script. Can you please help me getting if any changes in latest version OR any workarounf here. I have 35 servers backing up nightly with RSync and one of them is getting this error not matter what I try. All the servers are 2008R2 and the problem server and the daemon are the newest version available of cwRSync. Backups will start and will fail somewhere in the process of copying files at a random file. The file doesn't have permissions issues, is not large (under 1mb in some cases) and my network guy doesn't see any issues on the network side of things. Only one out of 35 servers is having the issue and it happens any time RSync runs. What's the proper way to get a login banner to display whenever someone SSH's into my COPSSH service? After installed copssh, can I move account svcopssh from administrator group to users group on windows 2008? Because any member of administrator group can login remote desktop. for security purpose, I would like to move it ayway from administrator group. I installed CopSSH Server 3.1.4 on Windows XP SP3, created a user named "rsync" for ssh'ing, activated it in CopSSH. Then I copied the generated private key to the client. The client is CwrSync 4.1.0. I'd like to run rsync over ssh. First, I try to establish SSH connection to my server by executing: "ssh -i rsync.key rsync@192.168.1.3 -T". Then I enter my passphrase for key, and then I get the response: "Connection closed by 192.168.1.3". The connection is working fine, the check_* services work fine to but the winping isn't working at all. I know that there is an updated version of it but i can't get my head around to get it "installed". The zip, which I downloaded from this page, contains multiple folders with multiple files. Simply copy pasting the winping.exe didn't do it.